TS PECET 2019 Notification,Schedule, UG DPEd-BPEd CET 2019, Apply before May .. Physical Education Entrance Test 2019: TS UG DPEd-BPEd CET 2019, TS PECET 2019 is a Common Entrance Test as Physical Education Common Entrance Test(PECET-2019) and its schedule has been released in the month of FEBRUARY, 2019 at Osmania University Campus and the test will be conducted by the Convener, PECET 2019, Department of Physical Education, Mahatmagandhi University for the academic year 2019-2020. Beginning from this academic year, Bachelor of Physical Education will be a two(2) year course. OU Physical Education Department Officials will invite the Online Applications from the eligible candidates for Admission into two years B.P.Ed and two years UG D.P.Ed Courses offered by the universities and affiliated colleges in the Telangana State for this academic year 2019-2019. Mahatmagandhi University is going to conduct Telangana State Physical Education Common Entrance Test -2019 (TSPECET 2019) and the schedule of the test has been released today at TSCHE, Hyderabad. The Physical Efficiency Tests will be conducted from 15 May 2019. A Common Entrance Test designated as Telangana State Physical Education Common Entrance Test (TSPECET - 2019) will be conducted by Mahatma Gandhi University for the academic year 2019-2020 for seeking Admission into B.P.Ed. (2 Years) and D.P.Ed. (2 Years) Courses. The Last date to submission of Online Application form is April 13 for Common Entrance Test for the entry into the Physical Education courses. The Tests will commence from: 15-05-2019(official). Candidates satisfying the following requirements shall be eligible to appear for PECET 2019. 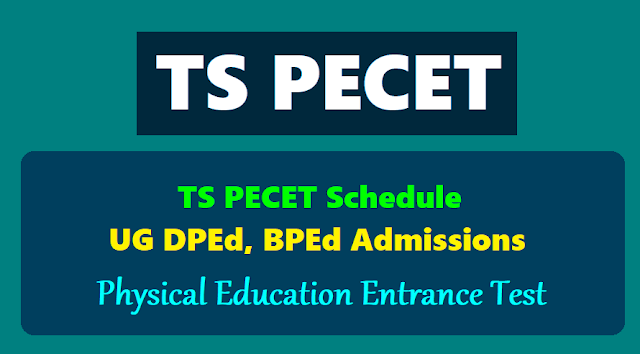 The Telangana State Physical Education Common Entrance Test (TS PECET 2019) Physical efficiency tests will be conducted from May 15, 2019. The last date of submitting online application form without late fee is extended. Eligible candidates, who wish to apply for PECET 2019, may submit their applications through Online mode only. The Registration fee @ Rs. 800/- (Rs. 400/- for SC /ST candidates )may be paid at TSOnline or APONLINE centers / meeseva centers / e-seva enters in Telangana and Andhra Pradesh /through payment gateway (Credit card / Debit card) from 17th March, 2019.
hai sir when was the exam date??? ?